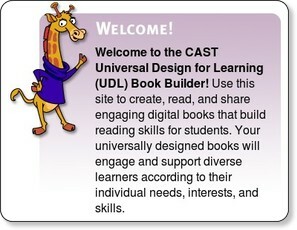 The Universal Design for Learning (UDL) Book Builder website offers tools that allows both teachers and students to create digital books. From what I’ve been reading, it’s primarily used by elementary educators, but because users select the images and write the text, this resource can also be used by and for older students. Gathering facts. How we identify and categorize what we see, hear, and read. Identifying letters, words, or an author’s style are recognition tasks—the “what” of learning. Planning and performing tasks. How we organize and express our ideas. Writing an essay or solving a math problem are strategic tasks—the “how” of learning. How students are engaged and motivated. How they are challenged, excited, or interested. These are affective dimensions—the “why” of learning. When you build a book, you have the option to include flash-driven characters that hover on the bottom of the pages. These characters each represent a different kind of learning style. They can be programmed to prompt the reader with a question or an activity based on the need or style of the learner. When the reader clicks on one of the characters, the question, prompt or activity is displayed or read out loud! It’s pretty impressive. And this is another way it is distinguised from RealeBooks. Realebooks does not offer this kind of interactivity. Another cool and unique feature is that you can include a glossary of words. This glossary exists as a separate page at the end of the book but the words can also be highlighted when they appear in the body of the text. Readers can click on word and be taken to it’s definition. What’s more, there are options for the way the glossary is designed; you can include images in addition to words so that visual learners can associate images with the definitions. And if you enable Text-to-Speech, you can narrate the entire book. Alternatively, you can upload different audio files if you want to include sound effects or other sounds to enhance the goal of the book. I can see using this tool to introduce new topics or assign the writing and design of a book as a class project. There are several possibilities for this fun tool and I’m looking forward it giving it a whirl. © hennessyhistory — Copyblogger theme design by Chris Pearson. WPMU Theme pack by WPMU-DEV.